Our trailer at the factory in Wakarusa, IN, on July 2, 2012. Welcome to my blog. The idea behind the blog is to share info about our small travel trailer and the various adventures we will have with it. 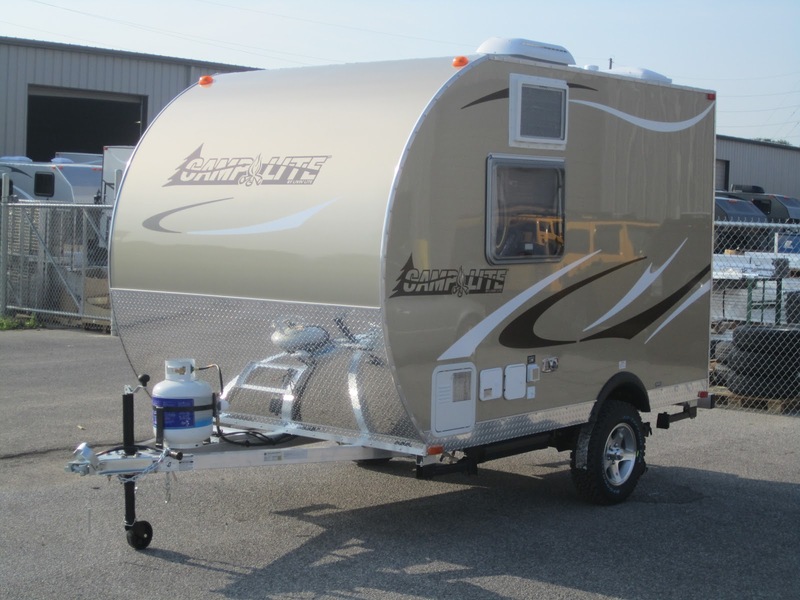 The trailer is a 2013 Camplite 11FDB manufactured by Livin' Lite Recreational Vehicles. Livin' Lite are different in a nice way. Their light-weight products are manufactured only using aluminum & composite materials. Our trailer was built without any wood or wood products -- so there is nothing to rot. Likewise the amount of steel has been minimized so there is less to rust than a typical trailer. Here's a rundown on the basic construction: The chassis frame is welded tubular aluminum just like a high-end boat trailer. The floor system is all aluminum too. It is made from interlocking aluminum extrusions that are welded to the chassis frame. The walls are framed in welded tubular aluminum with framing at approximately 16" centers and fully framed openings. Between the framing is 1" of rigid foam. To that frame are pressure-bonded aluminum exterior & interior skins. The aluminum interior skin was an option in lieu of the standard Azdel composite material Livin' Lite typically uses. (Azdel is a fiber-reinforced plastic material similar to what is used in molded automotive headliners. It is strong & light and has no formaldehyde used in its manufacture). The trailer's roof is also framed in welded aluminum complete with 3" of rigid foam, a one piece aluminum roof skin and a white Azdel ceiling. The ceiling skin & roof skin were also pressure bonded to the frame. With the pressure bonding using industrial adhesives there are no rivets or screws. The various wall & roof panels were sealed together using hidden resilient gaskets & mechanical fasteners rather than welding. This approach avoids cracking of welds that can happen in aluminum welds that are over stressed. The resulting trailer is both light weight and strong. Nothing flimsy about this trailer. The interior's cabinets, dinette, fold-down bunk, and walls for the wet bath are all framed in welded aluminum, skinned in aluminum and Azdel. No cheap particle board or luan plywood. No wood whatsoever. You could take a fire hose to the interior and not hurt anything. (The cushions might take a while to dry). Although the trailer's cabin is just 7' x 11' it is outfitted with a kitchen sink and two-burner propane stove, small 3-way fridge, air conditioner, private wet bath (shower & toilet), propane hot water heater and furnace. We did not order the optional snap-on carpet, microwave, outside barbecue, or entertainment system. We did have them upgrade all the lighting, inside & out to LED fixtures. We also had them install a Thetford cassette toilet in lieu of their standard toilet & blackwater tank. The toilet has an exterior hatch that allows a tank (the cassette) to be removed for convenient dumping into any regular toilet. The trailer still has a conventional greywater tank that needs to be dumped at a dumping station. The trailer is also equipped with an outside shower. Headroom inside the trailer is an ample 6'-4". The layout has the door at the back and the dinette & tip-down bunk at the front. This layout is really spacious for an eleven foot cabin. It feels bigger than many 13-to-14 foot trailers I've been in that had conventional side doors & rear cabinets. The trailer is equipped with a side awning system. It is kind of nice having full use of the space under the awning without having to keep circulation clear for a door. In addition to the standard air conditioner unit we had the factory install two Fan-Tastic roof vents. With up to 920 cfm each, the pair will really ventilate the space quickly. They are great when you come into the trailer after it's been closed up and baking in the sun. A quick blast with the fans will evacuate all the hot air without needing to rely on the air conditioner. I'm really fascinated by the design and construction of the Livin Lite Trailers. I'm struggling with questions regarding the towing capacity of my vehicle (2012 VW Sportwagen TDI w/DSG Transmission). In N. America the vehicle has no published towing capacity. The Euro version (identical specs - except for towing) has a gross towing capacity of 3,000 lbs. Warranty issues aside; do you think this vehicle has the capability to haul a trailer similar to yours? Hi David - I just looked at a VW forum where they discussed towing with your wagon and can see it is very contentious. I recently saw on the Yahoo's Livin Lite group where VW's with DSG were discussed. Someone posted that a VW mechanic advised they'd really have no problem with a small trailer. Your posting doesn't say where you live and where you plan to go with a trailer. If I were you I'd try to stay well under that 3,000 lb limit. All the regular stuff you take along on a trip really adds up so it helps to start with a light weight trailer. Although a small Camplite trailer like ours is light weight it does have a lot of wind resistance. It seems that wind resistance can put more strain on your drive-train than the actual weight. With our Jeep I've found the faster you drive the harder it is on the drive-train. That must seem obvious but easing off on the gas isn't always easy because driving fast is indeed possible. Our Jeep will pull the trailer at 80mph on a flat highway without much trouble but there is no doubt about it -- sustaining those speeds is awfully hard on the Jeep. Add some hills and I have no doubt that aggressive driving would destroy our Jeep. At slower speeds the Jeep can do what it is supposed to. A bonus is the driving is much more relaxed. When people say a particular small car can pull a Camplite I'm sure they are not thinking the driver will be a speed demon or be touring the Rockies. Instead they are likely referring to travelling a few hundred miles to a great campsite. nice trailer. was curious what the cost for the custom options were: separately if possible. I also like the cassette toilet and like that they were willing to install it. LED lights all around should be a std option.... dual hi flow fans are nice also...is your 'wall' a/c a frigidaire? btu's? what generator do you use?